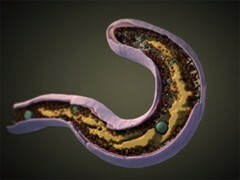 Three-dimensional structure of the bacterium Bdellovibrio bacteriovorus, including membrane (purple), nucleoid (yellow), ribosomes (dark red), and dense granules (green). Bdellovibrio is a predatory bacteria species that can invade other bacteria. It kills and eats its prey from the inside and then reproduces.